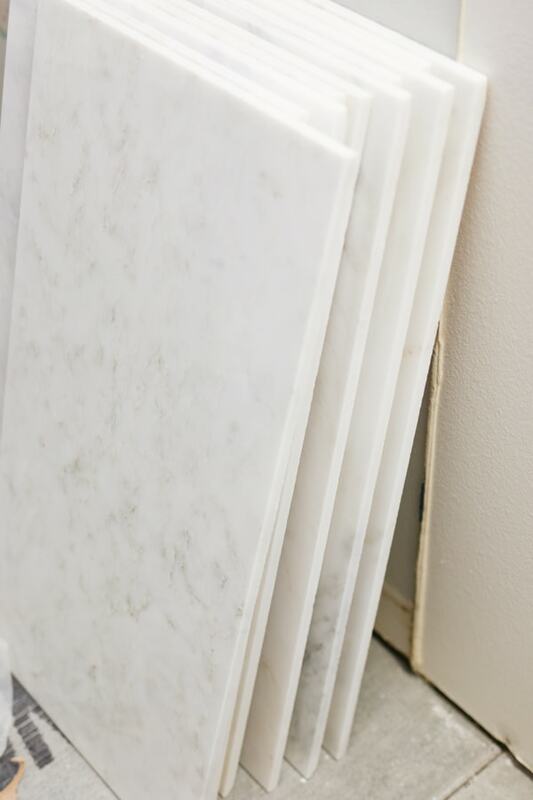 Tips, tricks and the steps it takes to install marble tile. Get the scoop to determine if it’s something you think you can do yourself, or if it’s a job you’d prefer to leave to the professionals. This post is in partnership with Wayfair. 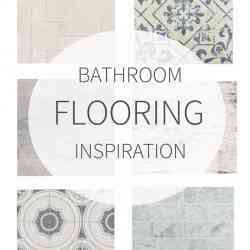 Be sure to explore their amazing online selection of tile and flooring options. You can also start at my personal favorites HERE. My handsome hunk of a man is here today to walk us through the steps of installing tile, in this instance, marble tile specifically. But Mr. TIDBITS assures me, you can use these steps with any tile job you encounter. 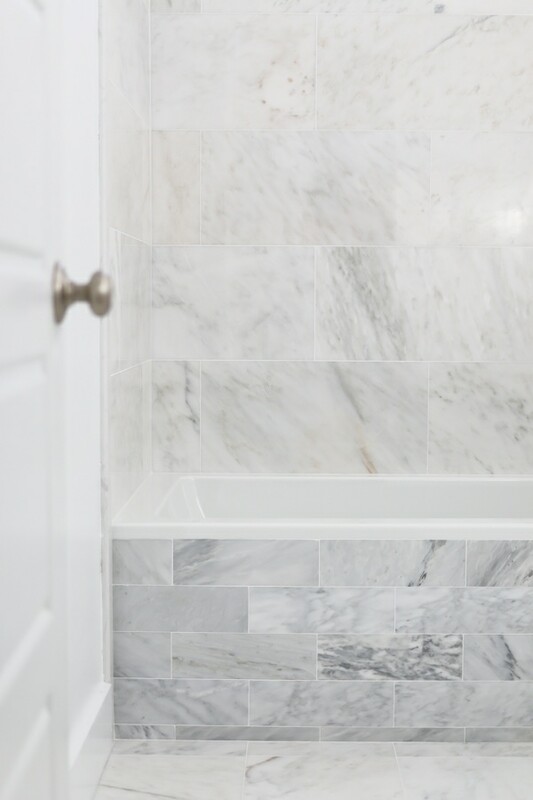 We just finished up THIS BATHROOM REMODEL, where we were thrilled to install marble tile on the floor, tub front, and shower surround. 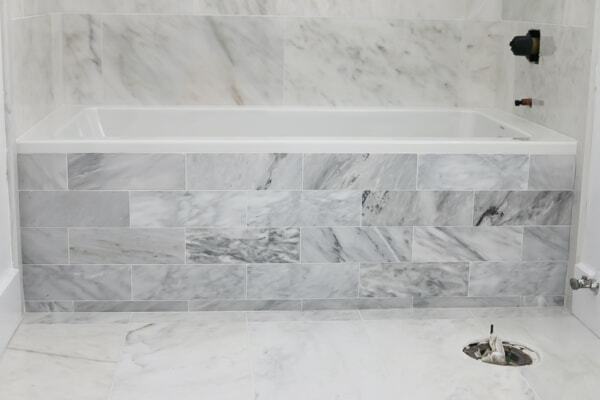 Marble flooring has been a dream of mine, it turned out absolutely stunning, and we saved big by doing it ourselves. My husband, Kevin, has done tile jobs for years and years. In fact, he did it as side jobs when we were newly married, full time jobs during summer’s, and in several homes of ours, including for families and friends. He seems to just get better and better, and has no doubt learned many things, which he is so kind to share with us today. You can find the exact selection of tile we made from Wayfair, by clicking the images on the slider below. 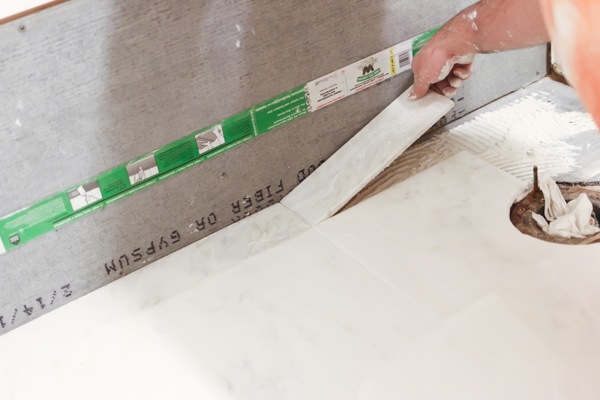 Without further adieu, I’ll let Kevin share his process and tips for installing tile and working with marble. Please feel free to ask us any questions or if you need further clarification. 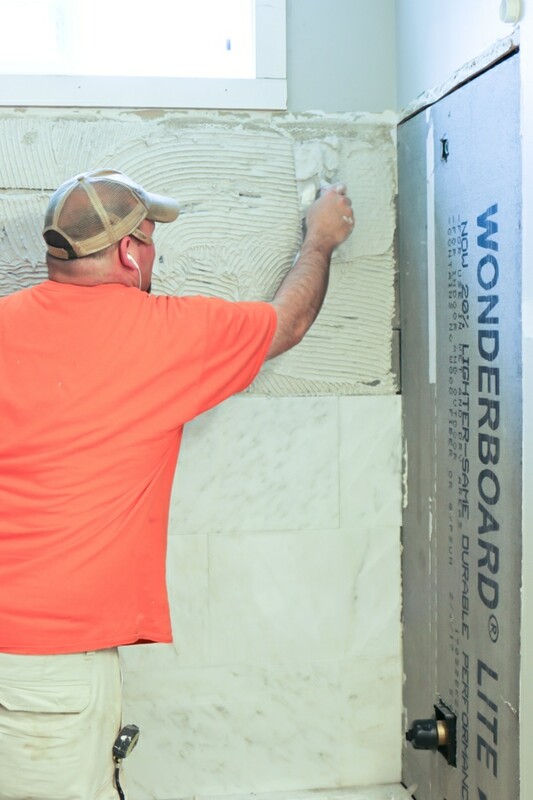 There are many ways to prep the walls and floors prior to installing tile. We used plastic behind a concrete board on the shower and concrete board on the floors. 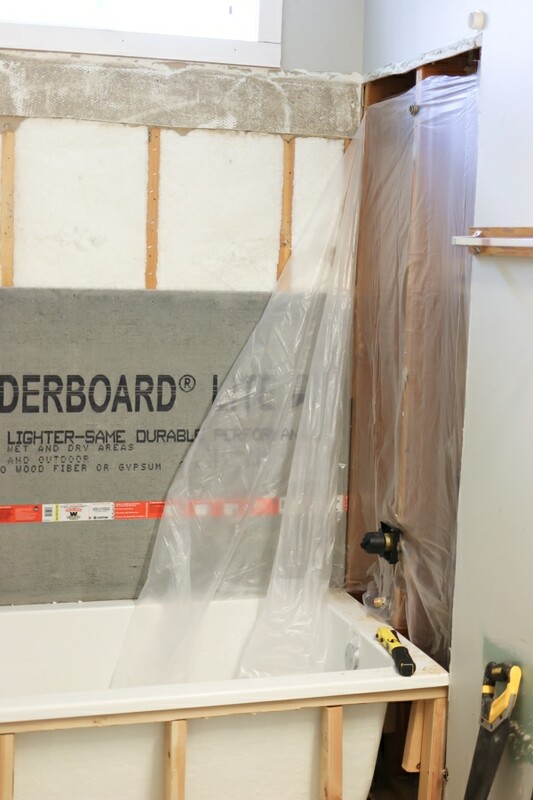 The concrete on the walls is the thicker 1/2 inch board so that it matches the surrounding sheetrock and the board on the floor is a 1/4″ thick. 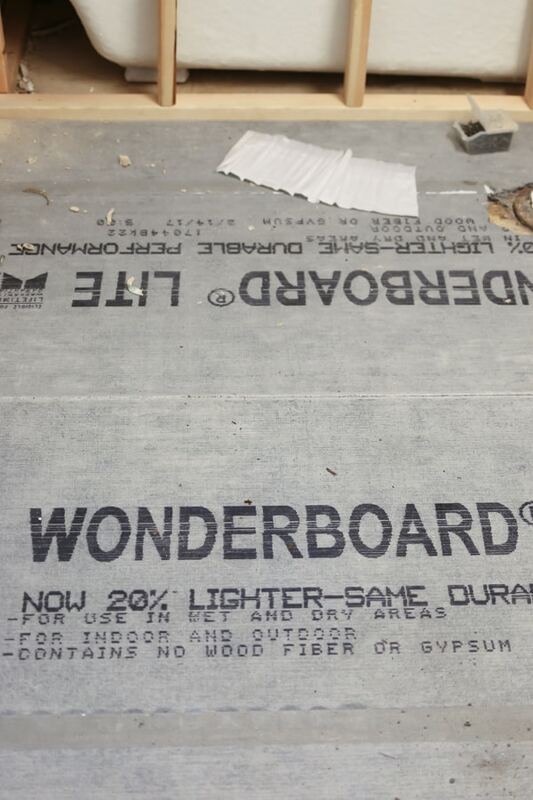 The plastic is just another added layer of protection to help keep any moisture that may get through the tile from damaging the wood and insulation in the walls of the home. There are many other options available on YouTube but this has been my tried and true technique after 12 years of installing tile. 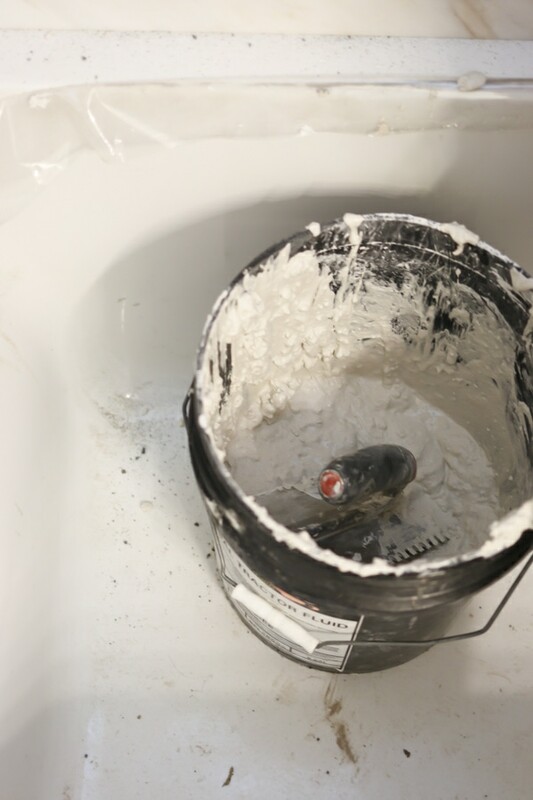 Using concrete board can get messy as small pieces of concrete can fall into the tub and if you aren’t careful you can really scratch up a tub when stepping on these pieces. Take extra care to clean out the tub and avoid stepping on the pieces of concrete at all costs. Use concrete board screws to install the board as they are specially coated so that the concrete will not deteriorate the metal over time. 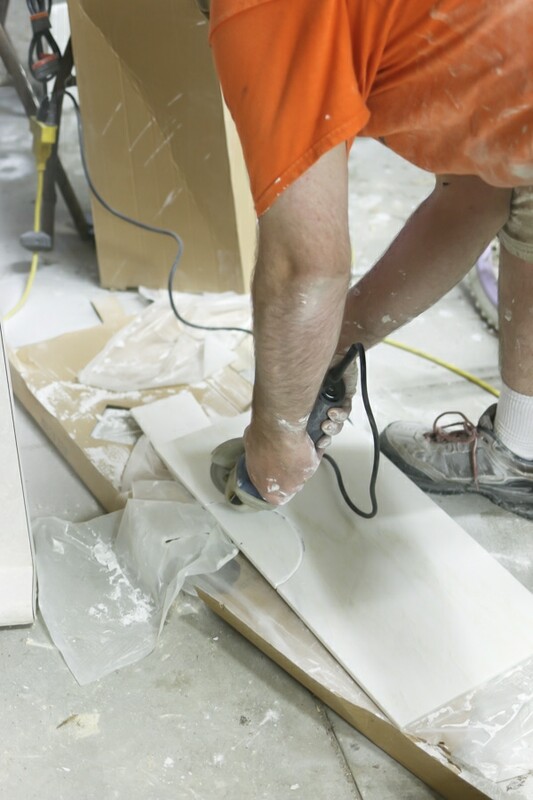 Be sure to clean the floors completely before you put in the cement board and do not cut them in place. Little pieces of concrete and debris will make getting a flat floor very difficult once they are under the board. They can also make popping and grinding noises under the tile while walking on the finished floor. I cut the board outside or in the garage then bring it in and carefully place it on the floor. A little extra time spent here will make for easier tile laying and a better floor. Before laying the tile add some water to the powdered thinset. Stores usually carry both white and gray. I always use white since it is a little bit cheaper but stronger than gray. There may be a purpose for the two different colors but I have never seen a difference between the two. I just start adding water in about two cup intervals to half a bucket of thinset as I mix it. You want to have a mixture that is runny enough to hold on to tile but not so runny that tile falls off the wall. Rice pudding is about the best way to describe it. Remember, the thinset will dry out so let it sit for 10 minutes or so before use to see if you need a little more water. It will continue to dry out as you go, so add a small amount of water if it looks like it is getting too dry. If you are doing walls you need to be sure that the surface you are tiling is level otherwise your corners won’t match up. 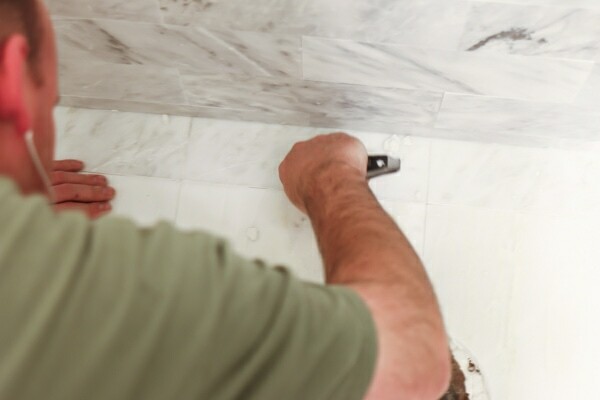 On uneven or unlevel surfaces, always start at the low end, this will require you to cut tile as you go on the first row but that is always better than having a large gap or trying to fit in little pieces. If the surface is perfectly level then you can do an entire wall at a time and just keep going one wall at a time, although I don’t recommend this approach for beginners. Spread an even amount of thinset on the wall first and then lay the tiles in, pushing firmly to seat the tile and make sure it adheres well to the thinset. 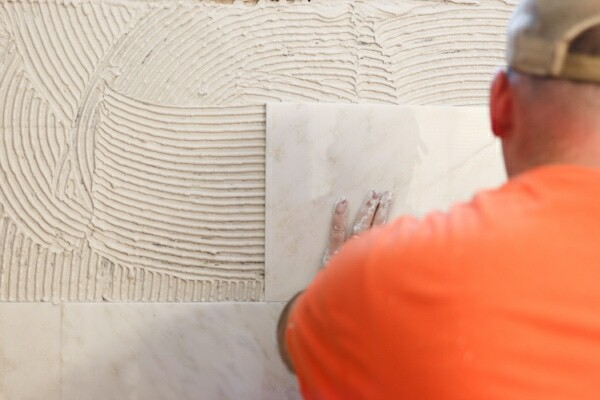 The thinset will suction to the tile and hold it in place if you have the correct consistency. If your tile is not even with the surrounding tiles, then take the time to remove it and add or remove whatever thinset is necessary. 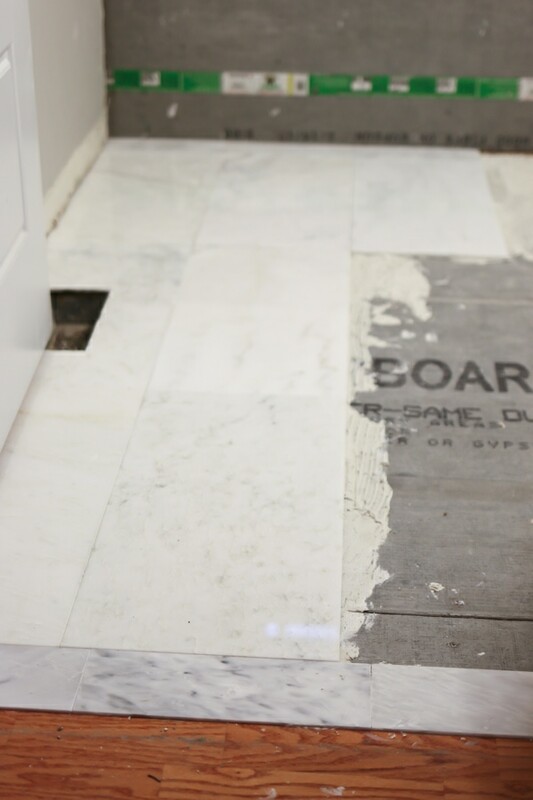 Trying to force the tile to fit will only result in cracked tile or uneven floors. 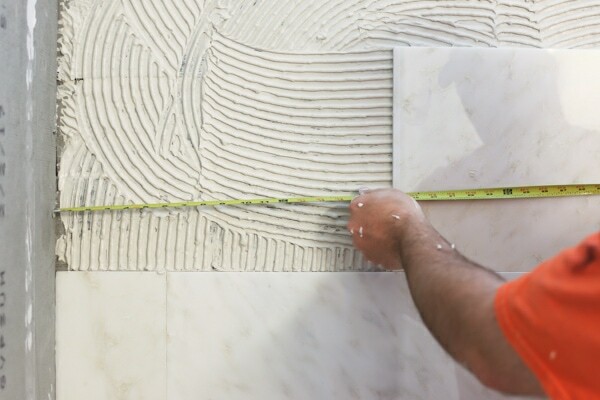 Measure and cut tile as you go and never assume that every cut will be the same as the other rows. I have never encountered a perfectly straight wall or corner in a house. 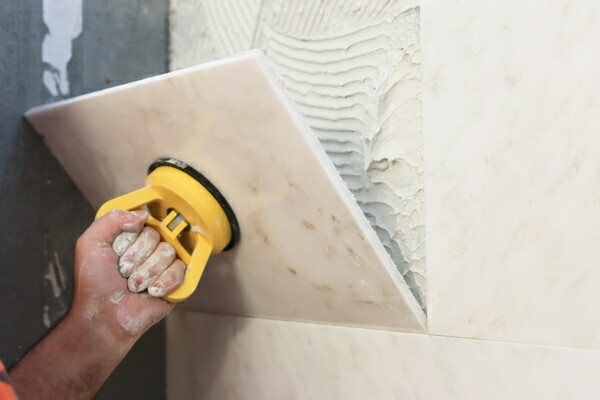 If using marble or granite tiles, a suction cup can come in handy for lifting or placing tiles especially if you are butting them up without gaps. 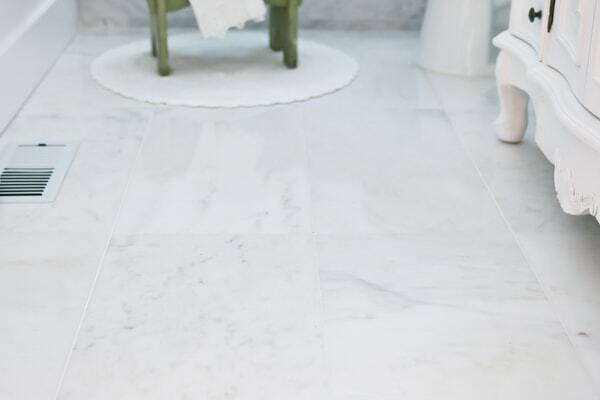 Generally speaking, marble tile has little to no gap between tiles. On floors always dry fit the tile to see the layout you want. I like to start at the doorway with a full piece of tile then do the cutting against the walls or tub. This gives a more professional look and dry fitting the tiles will give you an idea on how much you will need to cut. 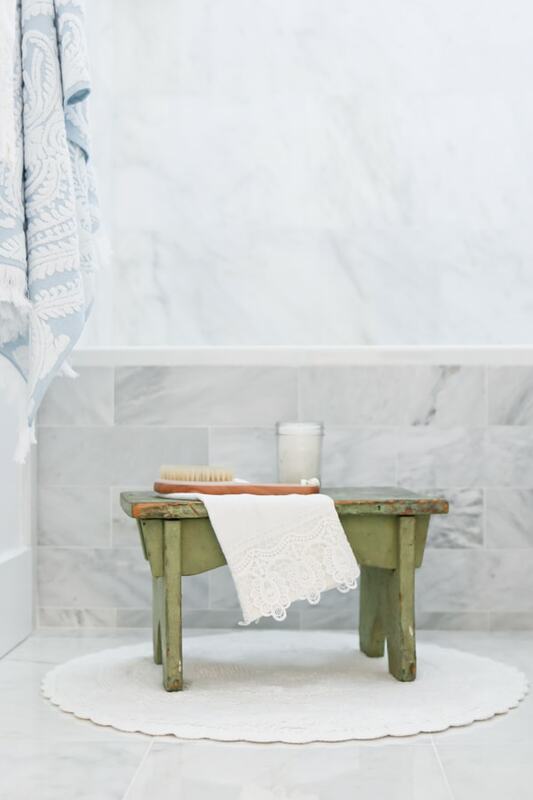 This method can make it very tricky for narrow bathrooms since you have to go in with a few rows and try and work your way back out without moving tiles but if you can do it you will be much happier with the quality of the floor. Just remember your days of playing twister as a youth, that is about what it feels like. As pictured here I went two rows wide to the bathtub and then had to tile the remaining floor as I backed out. It is very important that you make your lines straight so that it all matches up as you add the final row. 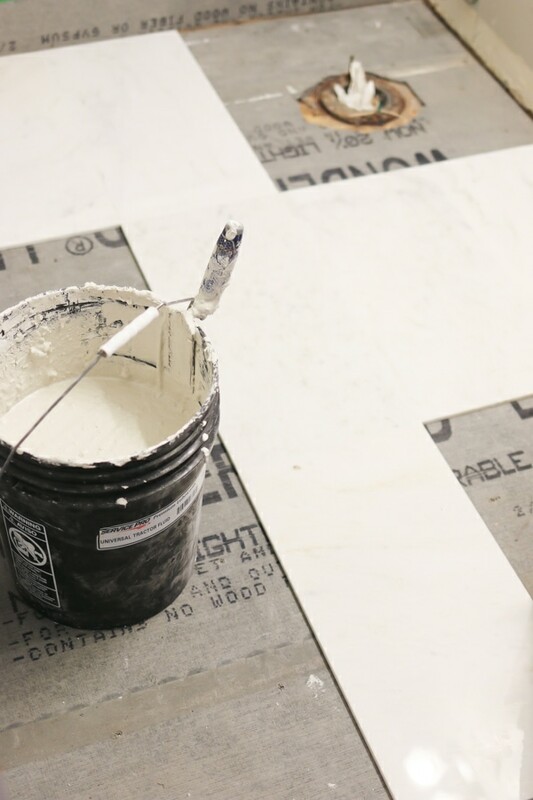 After waiting for the tile to setup (usually about 12-24 hours) take the time to prep your tile for grout. This means using a razor blade to clean out any thinset that is in the gaps between the tile, removing all spacers and cleaning the floor completely. Any foreign particles in the grout will only make grouting more difficult. Grout is much more forgiving than thinset when mixing, it needs to be runny enough to be able to fill in the gaps but dry enough that it stays in the gaps. When mixing the grout you only need to add very small amounts of water. Similar to making icing with water and powdered sugar, a small amount of water can take it from too dry to too runny, really quickly. Using a rubber paddle, spread the grout on the tile making sure to force the grout into the gaps. Try to remove as much of the grout from the surface of the tile as possible so as to make clean up much much easier. Spread diagonally to the spaces between the tiles so that the paddle doesn’t fall into the gap and force the grout out. Only spread a small amount of grout at a time, say about 6 or so tiles worth. Then taking a new and clean sponge with a clean bucket of water, wipe the grout off the face of the tiles and the spaces. 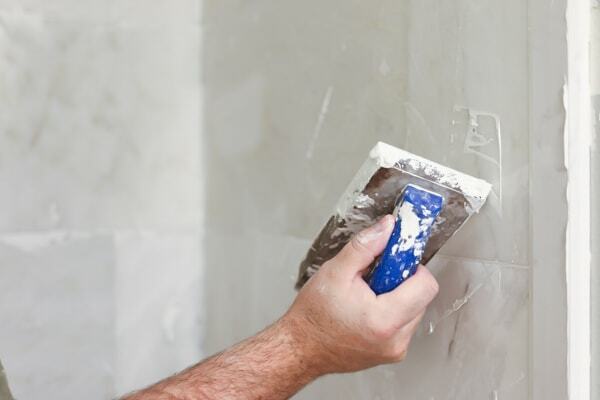 Do not put too much pressure on the sponge as this will make the grout and tile surface uneven. Also try and make long sweeps with the sponge, short back and forth motions will only remove too much of the grout from the cracks. 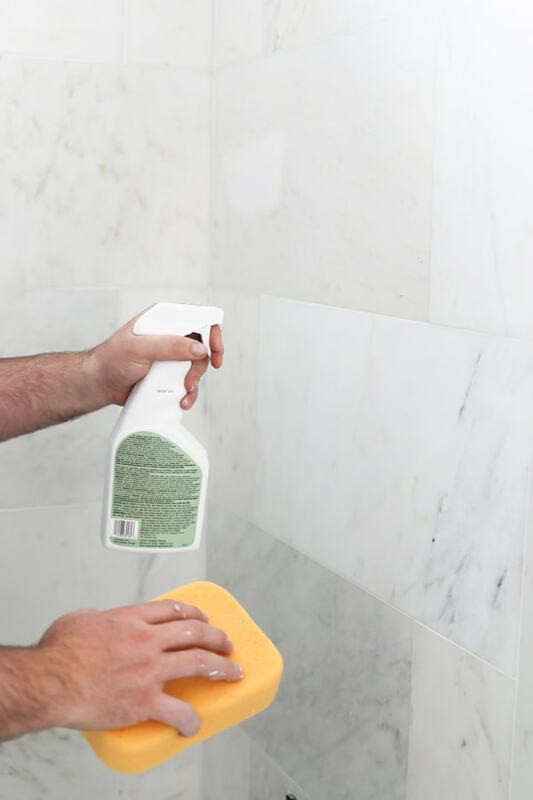 If you are finding that you have to scrub grout that has started to dry in order to wipe it off then either your grout is too dry or you are trying to spread too much at a time. The last stroke of the sponge across the surface of the tile should be with a clean side that you just rinsed off in the bucket. This means you get two swipes with the sponge before rinsing out again. Be sure to keep your bucket of water as clean as possible. 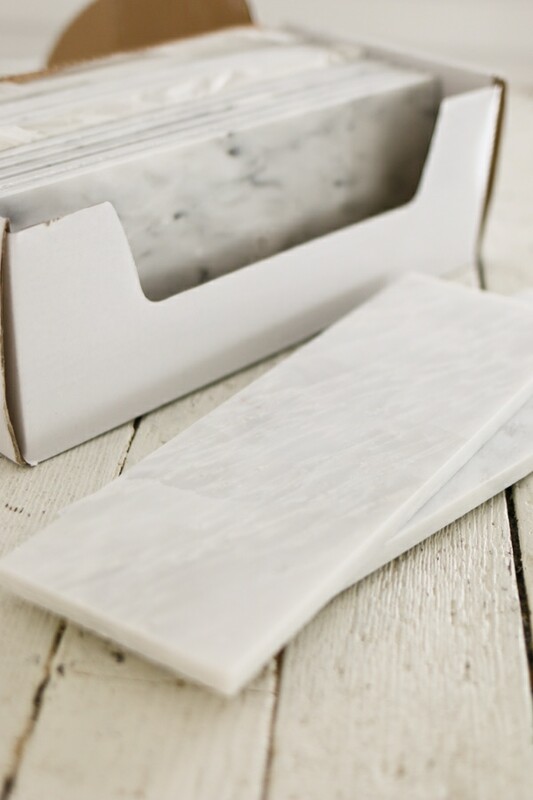 This will help you to keep a film of grout from drying on the surface of the tile. On some tiles this film is very difficult to remove and is better if you clean it off when it is wet rather than when it dries. 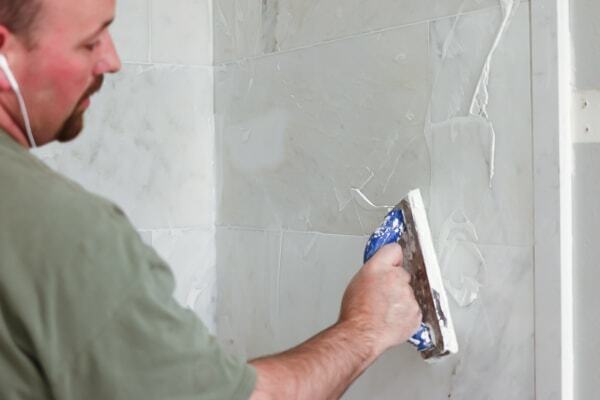 Using a new sponge for every tile job will help you to keep the grout even and looking professional, a ratty sponge will gouge the grout and ruin all your hard work. After the grout has had a chance to setup for a few hours, take a clean towel and gently wipe the grout film from the surface of the tile. This should come off as a light dust without any scrubbing and is one more step towards keeping a haze from permanently forming on the surface of the tile. 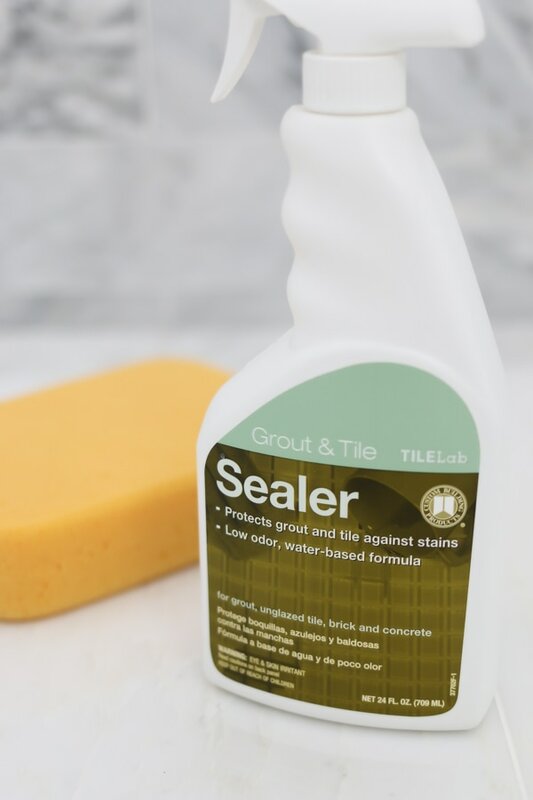 There are many different types of tile sealer on the market, they all have detailed instructions on how to apply them. Most of them are very simple and require you to spray them on using a spray bottle they supply or I have even used a weed sprayer to apply on large surfaces. After you spray it on a manageable section, wipe it with a sponge or rag to spread it around and make sure you cover the entire area. Wait a couple of minutes and then wipe off the excess. It’s as simple as that. We hope you’ve enjoyed this tutorial! 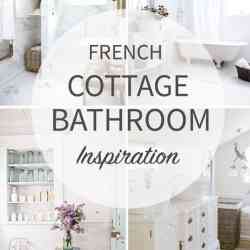 Feel free to check out our bathroom reveal post for more details of this space. this is an awesome tutorial and it looks amazing!!! You amaze me! SO beautiful! I can’t wait to do the same for our master bath. This turned out gorgeous!! I love that you added it to the tub! 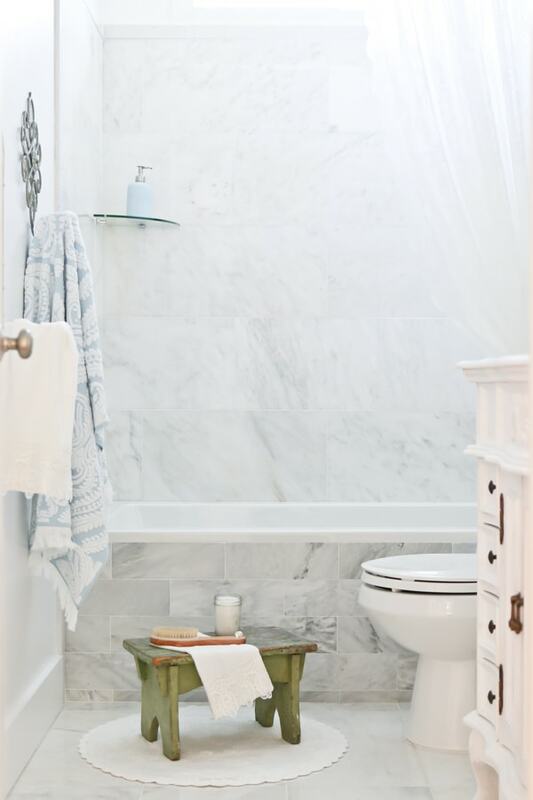 Marble tile is utterly gorgeous and gives your bathroom a timeless look. Thanks for walking us through the process! You bet! I hope it helped! I am guessing you will probably delete this, but I cannot even begin saying how bad this installation is. 100% chance of failure. Why? Because you didn’t educate yourself properly for correct techniques on waterproofing, thinset application, seam taping, proper fasteners, or water infiltration prep for a DIY’er. Mold has already started growing in your tub area. I give you props for trying to save a buck, but you failed the installation miserably. 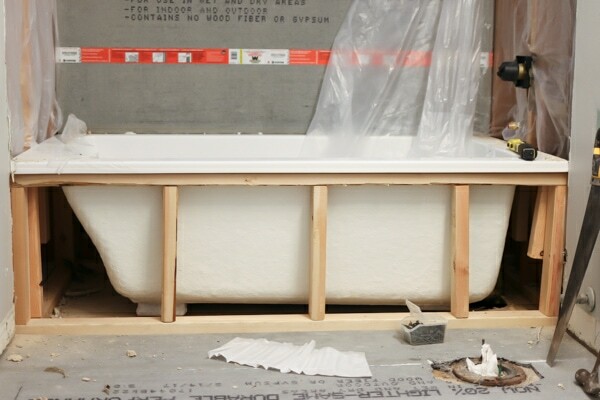 Not to mention it looks like a flange-less tub. Wish I had a sweetheart that can do a great job like your husband! Looks great! you did a great job and tiles installing tips are just awesome. However, your husband was successful and did the great job without messing because he had previous experiences. Installing tiles is not a easy job. It takes experience to master it. 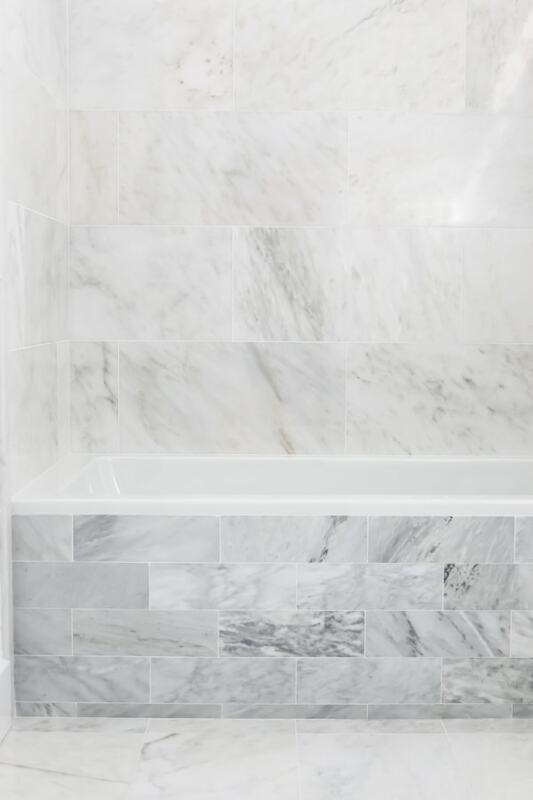 This marble look is so refined and beautiful, and I think you really had success. I love how simple it is! Thank you for sharing! It looks amazing! We are currently in the phase of planning everything also choosing the right tiles, and this one just inspiring on what kind of look we would like on our floor. Anyways, great post! Great Article. The very important information you shared by the article. Thanks. Very very informative article. Learnt so many things from you. Keep up the great job. Wish you all the best. There are an excellent tutorial and amazing explanation to rebuild the bathroom. So this blog helps me more to remodel my house. What is your opinion on bathroom shower cleaning?